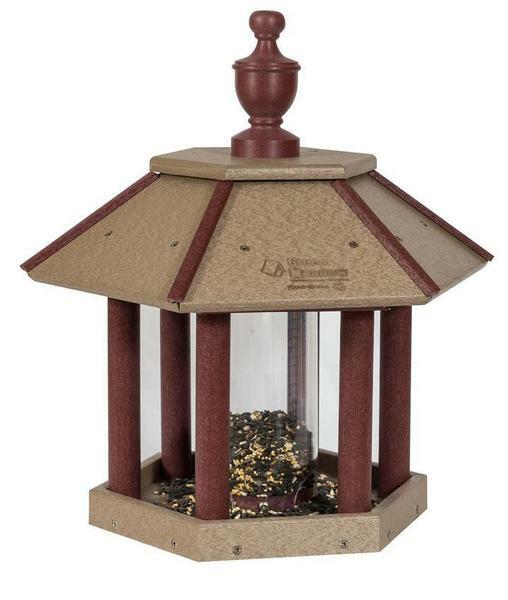 Take part of your day to relax and enjoy the outdoor view with our Amish Poly Gazebo Bird Feeder. We present a graceful gazebo here, that has a top that lifts up for easy filling. A cylindrical inner tube holds the seed and keeps it dry so you do not have to worry about it spoiling in the rain. Made of Poly Lumber. Consider our Squirrel Feeder to keep visiting squirrels out of the birdhouse.